Styled with martin blouse . Get into some pants. 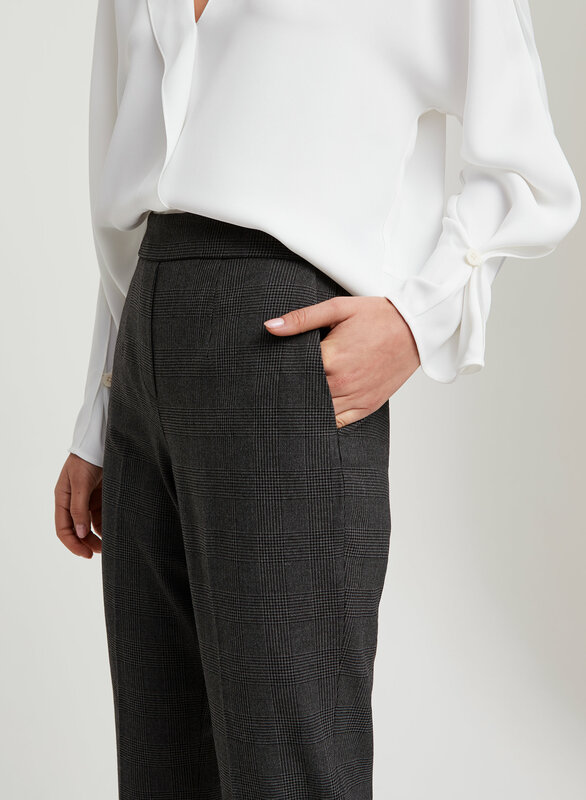 Just like the iconic Cohen Pant, but without the pleats. These ones are made from a yarn-dyed fabric which means the plaid is woven into the design, rather than being printed onto the fabric. Neat. I LOVE those pants ! This style is my go to for work. The only downside is that they are starting to pill a little bit in high friction area after 6 months of wearing. These are the best pants I've ever purchased. Finally a pair of pants that are meant to fit women's curvy bodies. I ordered the pants online in navy/green plaid and went to the store immediately after trying them on to get another pair in black. 10/10 would buy again. The only downside is that the woven material is starting to wear and pill after 4 wears, for that the 100% polyester pants are better. These pants were everything I was looking for; comfortable, professional looking, enough stretch, and a woven pattern instead of printed. However, I’ve worn them only 2 times and they’re pilling in the thigh area. I already sized up to accommodate my legs so I’m pretty disappointed especially considering the price. These pants are so comfortable, they’re made from the softest material. The elastic waistband is nice too, gives them an easy fit and also flattering. Usually I am a size 2 - I tried on size 2 and 4 and they both fit, I just wanted them to be a little roomier. I like it. 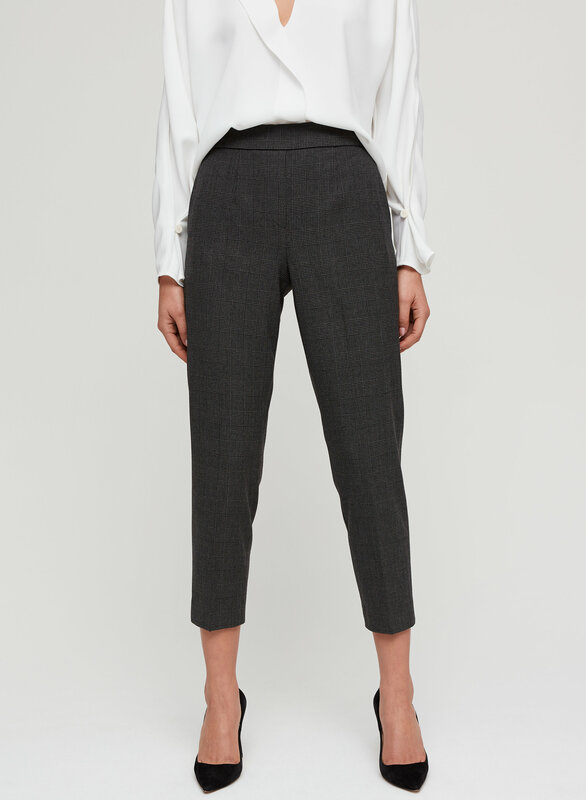 But it is similar to those office pants I own from artizia. 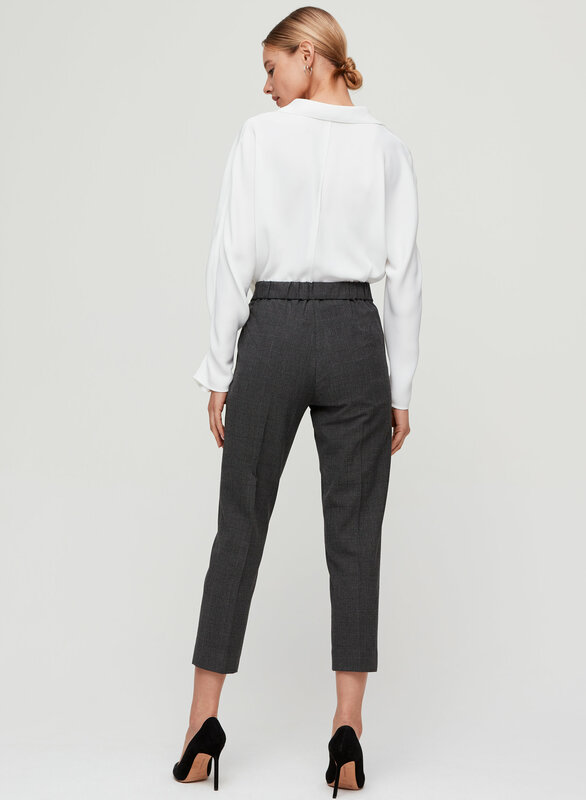 Yet to see more shaped office pants in coming seasons. 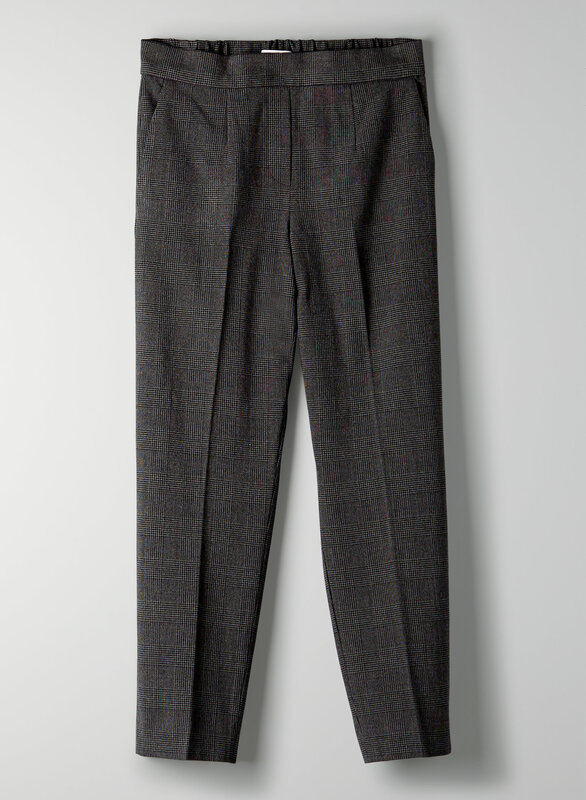 The Conan pant is far down of one of my favourite pants from Aritzia, I have 4 pairs already. The grey checkered print can easily be paired up with an oversized grey or black sweater. They do fit a little more snug than the OG conans but the fabric on this one is very stretchy so order your regular size. These pants fits so well and I love that you can throw them in the washer instead of dry clean. I personally feel that these fit better on me than the normal Cohen pants (terado) as the thigh area is more slimming. Not sure if it’s these pants in particular or Conan pants in general. I have this pant in countless styles and colours. They look great on; BUT my only complaint is that the ankle seams are not reinforced and they hems get loose easily. Very annoying! I love these pants. They are like wearing pyjamas at work and still looking like a professional due to the slight stretch and elastic waist. I have 3 pairs of Conan pants, but this iteration with the yarn-dyed plaid is really cute, comfortable, and flattering and I’m a big fan. I’m always size 0 in baboon pants and this one fits me like a glove. It’s a bit hard to pull it on but the elastic waist helps. It’s great for seeing and summer since the fabric is not thick enough but the quality is there. I love the fit of the pants, the fabric is very soft and comfortable to wear.